Richard Petty, me, and my wife Laura. Circa 2002. I had a chance recently to interview Richard Petty himself for an upcoming podcast show, and I’ll admit that it was one of the few interviews I was actually a little nervous about beforehand. I’ve been really fortunate to interview some important people in the industry related to muscle cars, but Richard is clearly the biggest celebrity thus far (sorry, Tanner Foust – you’re a close second). Richard is a living legend in the NASCAR world – actually, check that – he’s just a legend, period, and it was great to find out first hand that he really is just a nice as everyone says. I’ve heard for years that Richard would stand for hours signing autographs until the last person was served, and now I believe it. He was completely genuine and spoke about the history of racing, Petty’s Garage (his hot rod shop), and things in between as well. It was proof to me that with Richard Petty, what you see is what you get. There is no veil or corporate image. Richard is simply Richard, take it or leave it. It’s utterly clear to me while even today he is still the ambassador for NASCAR. This was not my first time to meet him though. My wife and I started following NASCAR right after we were first married. We were living in Minneapolis then and had heard on the radio that Petty would be at the Mall of America signing autographs. One of his sponsors at the time was General Mills (also located in Minneapolis), so we decided to go get in line and meet him. He was as cool as could be and looked just as you’d think he would; sunglasses on, signature hat, and black mustache. We met him, shook his hand, got a picture with him, and then received a little Hot Wheels sized #43 stock car to take home with us. I think we even received a free box of Cheerios (I prefer Honey Nut). Pretty cool, indeed. Strip Weathers (“The King”) from the Pixar movie, Cars. The smile is pure Petty. Since I have little kids it was hard during the interview not to keep thinking of “The King” from the movie, Cars, because, well, they sound completely alike! My kids love the movie and watch it nearly every road trip we take (their dad may like it as well). 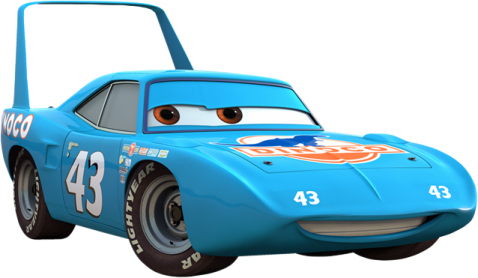 The character in the movie was voiced by Petty himself and was made to represent one of his most famous race cars ever, a 1970 Superbird, with Petty blue paint, the #43, and everything. I loved the detail that Pixar put into Petty’s character, both in the realism of the car itself and in the dialogue Petty had. When I told my kids that I had interviewed Richard Petty it didn’t quite click with them as to whom I was referring. Then I showed them a picture of “The King” from the movie and they were impressed.